Growing up, my Mom made an eggplant dish about once a year that was basically chopped up eggplant mixed with homemade marinara sauce, garnished with Parmesan cheese. The only way I could swallow the evil stuff was to absolutely drown it in Parmesan–I’m pretty sure I used half a bottle of the grated cheese every time she made it. It’s not that the taste was terrible, the marinara was always good, as was the Parmesan, but the eggplant itself was spongy and a bit bitter, so I had to distract myself by making it super cheesy in order eat it. Despite never fully enjoying this dish, I was convinced that I would enjoy eggplant if prepared differently. I really wanted to try making eggplant Parmesan, sensing that frying eggplant and making it crispy could be the key. But for some reason, I just never got around to it. Probably because I had been tainted by a long history of a dish with similar elements that was always abhorrent to me. I finally tried eggplant on a pizza (click here for the recipe: Eggplant & Olive Pizza) and then in baba ghanoush (a Middle Eastern roasted eggplant dip) and discovered I was right, I did like eggplant! Well, finally, in a lower-carbohydrate phase of our diet last month, I decided to try my hand at eggplant parmesan, using only cheese for “breading” before frying it. It. was. fabulous. I’m sure I’d love it with the breading as well, but this was truly delicious and in my opinion, need not be changed. I seriously can not wait to make this again. I’m now a full-fledged eggplant convert. They key, it seems, is not so much in the frying, which obviously doesn’t hurt, but in the salting and draining prior to cooking. This takes away the bitterness and makes the eggplant flavor much more enjoyable. I also want to take a moment to mention the tomato sauce, which I snagged from Jenna’s blog and kicked up a notch with fire-roasted tomatoes, and a touch of fennel seeds and red pepper flakes. This is my most favorite marinara sauce I’ve made to date, very flavorful and a great compliment to the eggplant. It makes a large batch, so you’ll have enough leftover to freeze for future eggplant Parmesan meals, or to ladle over pasta. It gives me such a heady feeling to know this delicious sauce is waiting for me in pre-portioned bags in the freezer, and all I have to do is defrost it in order to enjoy it again. Thanks for the wonderful recipe, Jenna! I’m submitting this recipe to Renee for this week’s BSI (Blogger Secret Ingredient contest): Parmesan. Peel and slice eggplant into ¼” thick slices. Sprinkle both sides liberally with salt and place in a colander set over a bowl. Allow the eggplant to drain for 30-45 minutes or until 2 tablespoons of water have been drawn out from the eggplant. Tear off three sets of two sheets of paper towels (each set of two still connected), stack together, then lay out eggplant slices on top of it. Tear off another three sets of two paper towels, lay on top of the eggplant, and press down firmly on each slice to draw out excess moisture. In a flat-bottomed bowl large enough in diameter to fit the largest eggplant slices, whisk the eggs and water together until foamy. Put the Parmesan cheese on a plate and have your garlic powder nearby. Line a baking sheet with foil, sprinkle evenly with garlic powder, and set nearby. Dip each eggplant slice in the egg mixture, shake off, then sprinkle both sides with Parmesan. Lay the slices on the prepared baking sheet as you finish them. Once all slices are coated, sprinkle garlic powder on top. Heat a cast iron or other heavy-duty skillet over medium-high heat. Add enough oil to cover the bottom well and come up about 1/8”. Place as many eggplant slices in the skillet as will fit, and tuck as many of the cloves of garlic in between them as you can. Fry the eggplant until the first side is golden brown, about 2 minutes, then flip. Flip the garlic cloves when then skin is golden brown and bubbled. Once the second side is golden brown, remove to a cooling rack lined with paper towels to drain. Remove the garlic as it is finished cooking as well. Continue cooking eggplant in batches until all is fried. If the first batch of eggplant has cooled too much by the time you are finished frying it all, pour out the oil in the skillet and add them back in to reheat for a minute. Alternately, as the eggplant is drained, you can add them to a foil-lined baking sheet and keep them in a warm oven until ready to serve. To serve, arrange eggplant slices on plates with fried garlic scattered around. Scoop tomato sauce over the top and garnish with Parmesan and parsley, if desired. Serve hot. In a large pot or Dutch oven, heat the olive oil over medium high heat. Add the onion and garlic, and cook for about 2 minutes, until soft and translucent. Add the celery, carrot, and some salt and pepper. Cook for about 5 minutes, until softened. Add the tomatoes, bay leaves, basil, oregano, fennel seeds, and red pepper flakes, and cover the pot with a splatter screen. Turn down the heat to low, and simmer gently for 1 hour. Remove the bay leaves and taste for seasoning, adding salt and pepper as needed. Using an immersion blender, blend the sauce until smooth. Allow the sauce to cool completely and, if not using immediately, pour it into freezer bags in 1-2 cup portions. It will keep frozen for about 6 months. 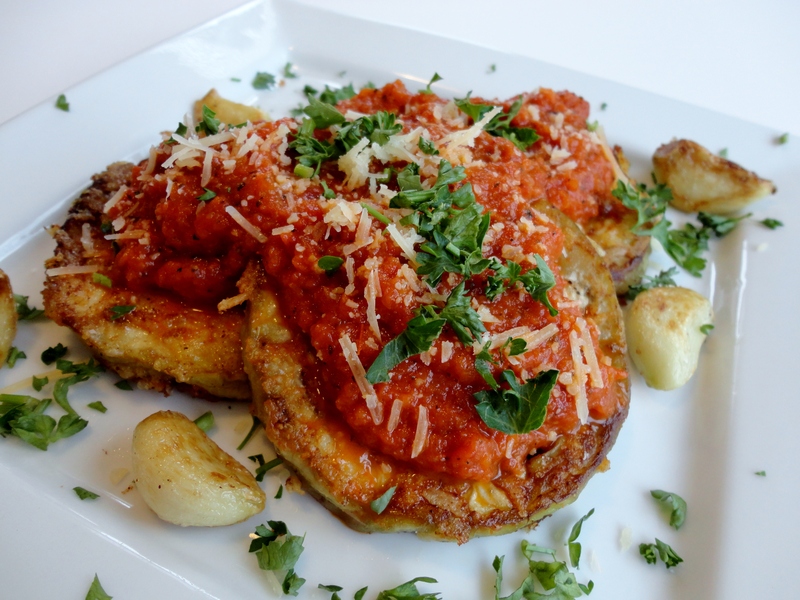 Posted in Italian, Meatless, My Favorites and tagged breadless, diet-friendly, eggplant parmesan, fire roasted, fried garlic, gluten-free, gourmet, low carb, marinara, tomato sauce. Bookmark the permalink. I think most people have had a disastrous egg plant dish, I know I have. This certainly looks like a winner though! I think you are definitely right, the key is salting the eggplant and letting it drain. Ever since figuring this out I have much better luck with eggplant. I tried a baked eggplant parmesan from Cook’s Illustrated that I absolutely loved. You get that crispiness that you get from frying without having to deal with all the oil. The recipe is on my blog if you want to check it out. Wow, this looks AWESOME! I love eggplant but haven’t really mastered how to prepare it, so I’ll be trying your technique! And BTW, my sisters also made that tomato sauce but added some beef bouillon and some maple syrup–she said it added amazing depth, and I totally want to try those additions next time. Thanks for submitting…this really does look FANTASTIC! 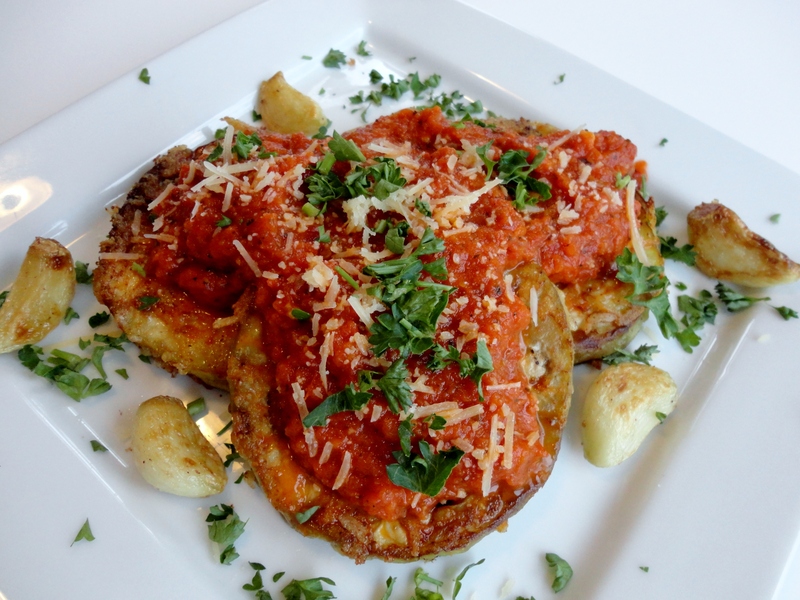 and I love eggplant parm…so I WILL be trying this dish in the future! Did I miss the step where you rinse the eggplant? Because it was just horribly SALTY. No, you don’t need to rinse. I’m so sorry it was so salty for you! I’m pretty sensitive to salt and thought it was perfect so I don’t know what was different. I used quite a bit of salt but then after pressing the pieces between the paper towels, I think most of the salt came off on the paper towels. I’m sorry it didn’t work for you. I know, that has happened to me too. I don’t like to salt eggplant for that reason. Do you rinse the eggplant before you salt it? Thanks! No, just salt it. Unless you drop it on the floor, then rinse it. LOL! This is the best ever! I could eat the marinara sauce by it’s self! My husband even bragged on it!